That’s no simulation! It’s truly amazing. You can find out more about how James made the video and took the footage at his blog: LabJG: James Gilbert. Today we have a guest post by Lauren Kelly. Lauren is an Educator for STEM Student Experiences at the Adler Planetarium in Chicago, IL, and holds a degree in Science Journalism from Columbia College Chicago. She loves working with young people and encouraging them to explore science. 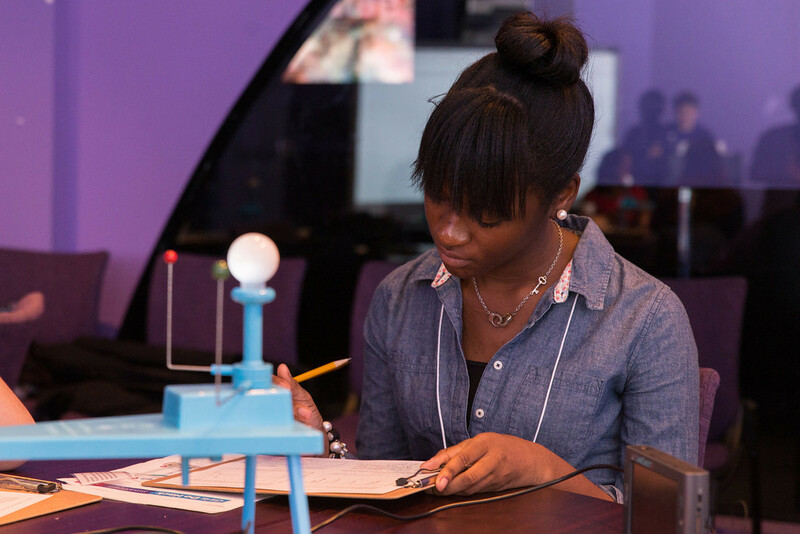 On November 9th, 65 young women participated in Girls Do Hack at the Adler Planetarium, where they explored science, technology, engineering and math skills and fields as future career options. It was a incredibly fun, inspiring day. 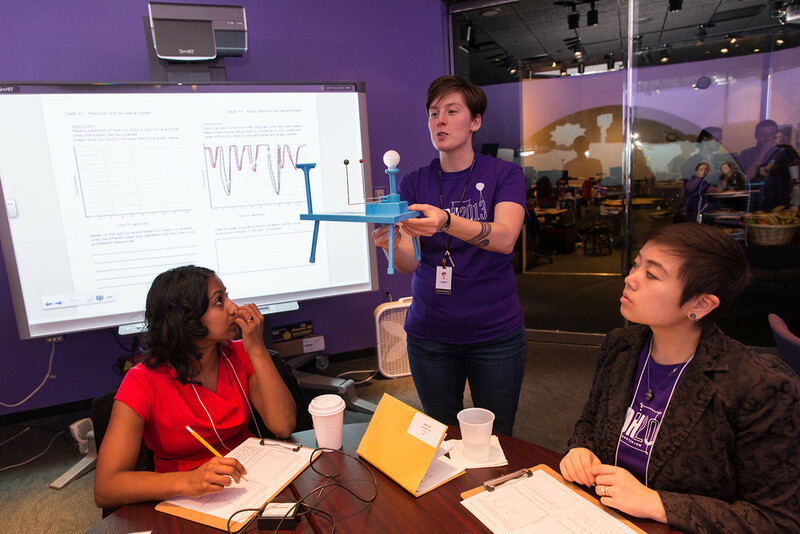 As an Adler educator, I had the wonderful opportunity of leading a session about detecting exoplanets that many of the girls participated in. During the session, participants discovered how scientists find exoplanets using the transit method by doing a hands-on experiment creating and measuring light curves, practicing categorizing transits on Planet Hunters and working with the help of a postdoc Astronomer to explore real systems using NASA’s Eyes on Exoplanets program. It was brain-bending work, and it sparked many interesting discussions about how scientists verify the existence of exoplanets and what the many different types of exoplanets would be like to visit. Besides having a ton of fun, the girls practiced real science skills by analyzing data, identifying patterns, using technology and solving problems in teams. They seemed to be genuinely excited and inspired by the science of finding exoplanets and I wouldn’t be surprised if some of the participants contributed the 20 million classifications now on Planet Hunters in the days since Girls Do Hack! There was a great question about transits in response to my post about “What Factors Impact Transit Shape” so I thought I’d answer in a blog post. 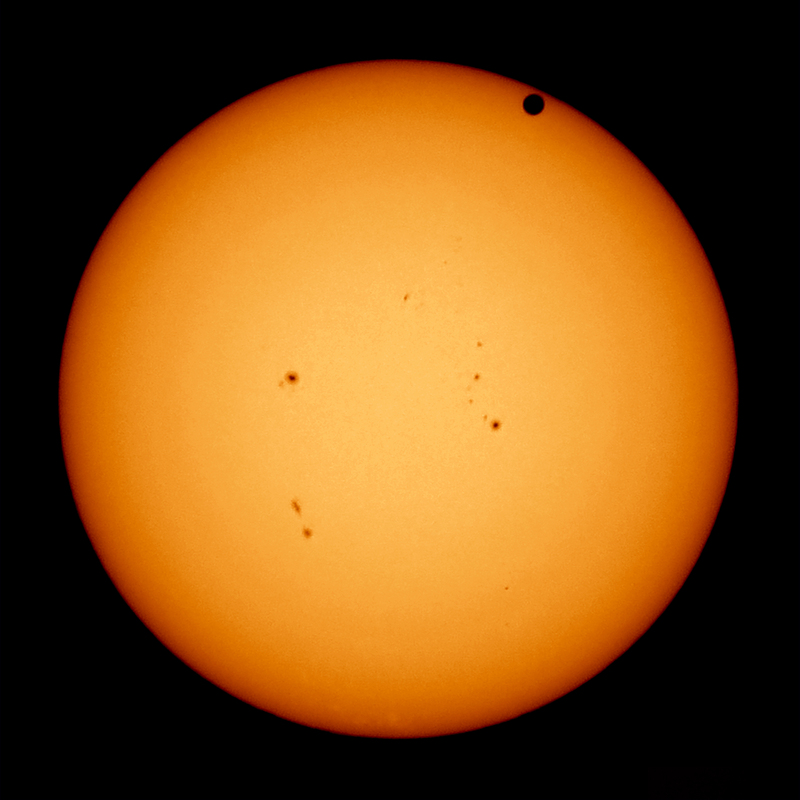 Question: In the image of Venus transiting the Sun, there are sunspots. How common are sunspots on the Sun-like stars in the Kepler field? How do sunspots change the transit light curve? How are sunspots modeled? Starspots are dark blotches on the surface of the star and are regions of intense magnetic activity. Their temperature are lower than the rest of the photosphere which gives them their dark appearance. These blemishes are transitory and last anywhere from hours to months. They are an indication of the magnetic activity of the star, and the Sun goes through an 11-year cycle where the number of starspots (or sunspots as we call them on the Sun) changes. The more active the Sun, the more sunspots visible on its surface. If you viewed the transit of Venus last July, there were several sunspots on the surface of the Sun which you can see in the image below. Transit of Venus – Image credit- Wikipedia – http://en.wikipedia.org/wiki/File:2012_Transit_of_Venus_from_SF.jpg – Venus is at the top right of the Sun’s disk. Other dark blotches are sunspots. On the Sun we can actually spatially resolve the sunspots, but on other stars we can’t. So for Kepler that is monitoring stars thousands of light years away, we detect starspots through the light curve. As the star rotates, starspots will come in and out view causing changes in the star’s brightness. The pattern in the star’s light curve will repeat once per rotation period of the star. At the equator, the Sun rotates every 24.47 days much longer than the short few-tens of hours that a planet transit lasts. If the transiting planet doesn’t cross over a starspot we get a fairly rounded U-shaped symmetric bottom to the transit as you can see below for a set of simulated planet transits. Because planet transits last a few to tens of hours and stars rotate over a period of days, you can think of the starspot as effectively stationary with the planet moving across it during the transit. The starspot is not as bright as the surrounding areas of the photosphere, so when the planet transits across that starspot the lightcurve gets a bit brighter than average and you don’t see a symmetric bottom to your transit. So you see a small positive bump in the transit lightcurve. 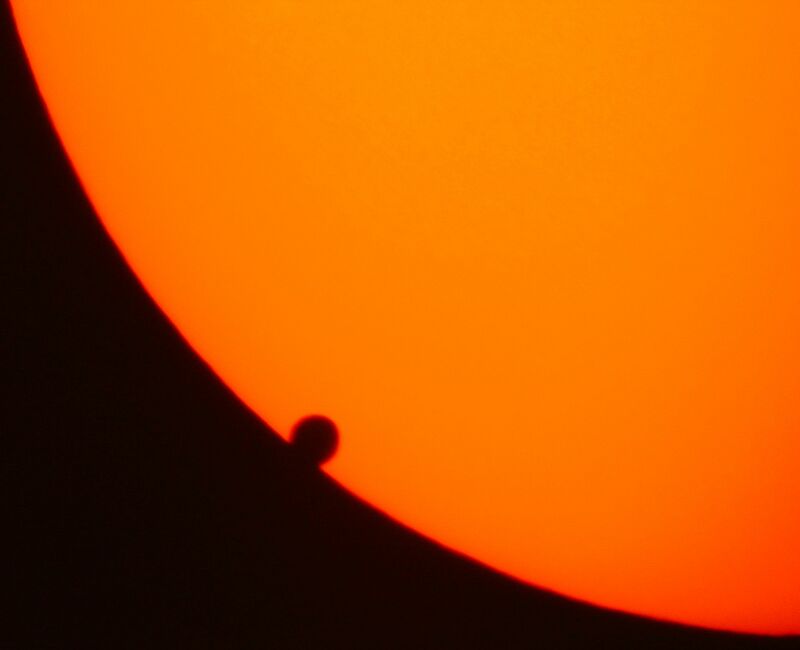 In the observed transit shown below, the planet crosses a starspot during the second half of the transit. Planets transiting starspots can be extremely useful. Those transits have been recently used to measure the alignment of the planet’s orbit to the rotation axis of the star. 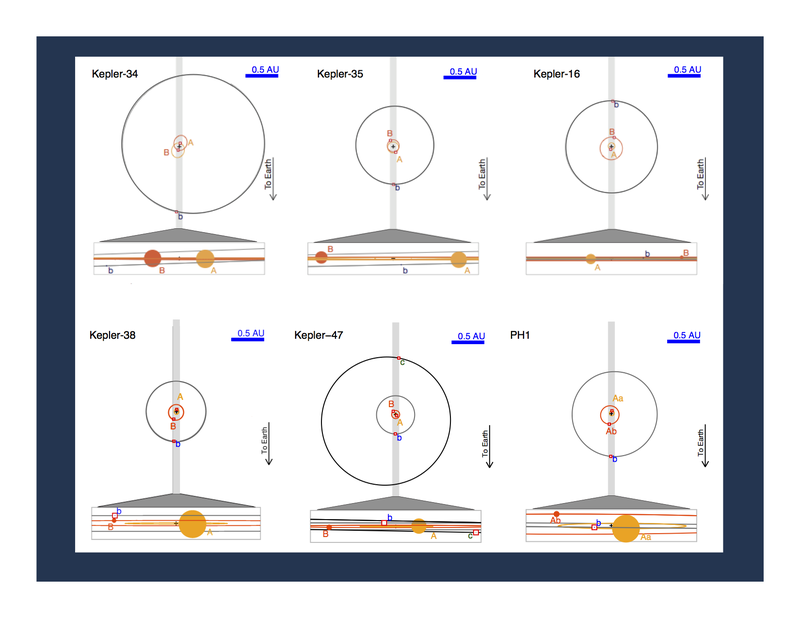 In our Solar System, the planets are about 8 degrees off from being aligned with the Sun’s rotation axis, but other planetary systems are severely misaligned. If the planetary system is aligned with the star’s rotation axis, then the planet transit path is a chord that always crosses over the starspot when it is in view, so you will see many of the planet transits having the signature of a starspot crossing. Because the star is also rotating between transits, the starspot will be likely be in a different place on the star’s disk the next time the planet comes around so you will see the timing of the bump change from transit to transit. 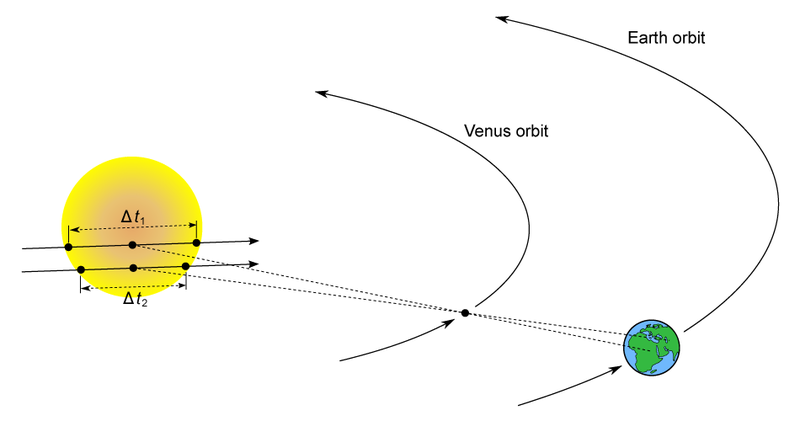 If the orbit is misaligned, then only when the starspot is in a position crossing the planet’s transit chord across the star’s surface will there be a positive bump in the transit lightcurve. So the next several transits the planet has extremely low chances of being timed such that the starspot is in the same position on the star’s disk for the event to repeat. So you should see no starspot signal in subsequent transits. You can see this effect below in the figure from Sanchis-Ojeda et al 2012. I’m rewriting the simulation code I use for making simulated transits and injecting them into Kepler light curves from a program language called IDL to python. I’m working on a new paper idea and project with Planet Hunters so I thought now would be the perfect to time to make the coding switch. The actual part of the code that computers the shape of the transit comes from publicly available code written by another astronomer, Ian Crossfield (if you want to play with the code you can find it here). I’ve been doing some simple tests to make sure the code works and thought that it would be worth using the test output as a great way to talk about a few things that affect the transits that you see in the Kepler light curves on the Planet Hunters website. The transit depth is the ratio of the surface area of the star’s disk blocked out by the planet’s disk. So the transit depth is the square of the planet radius divided by the star’s radius. The majority of Kepler stars are similar in size to the Sun or a bit bigger or smaller, so in general the bigger the planet the bigger the transit you see. Below is the ideal transits you’d see for a series of planet radii assuming the star was perfectly quiet and is uniformly bright. For the plot below I assume the star 0.8 times the radius of the Sun and the planets cross the center of the star. These transits are very boxy – In real life they won’t look like this at least not on the ingress and egress (the edges of the transit). That’s because the a star is not a uniformly illuminated disk. It is darker at the edges than it is at the center. We call this limb darkening. What is happening is that you are seeing into different layers of the Sun depending on how far from the center of the disk. So the center is hotter layers and therefore brighter than the edges. 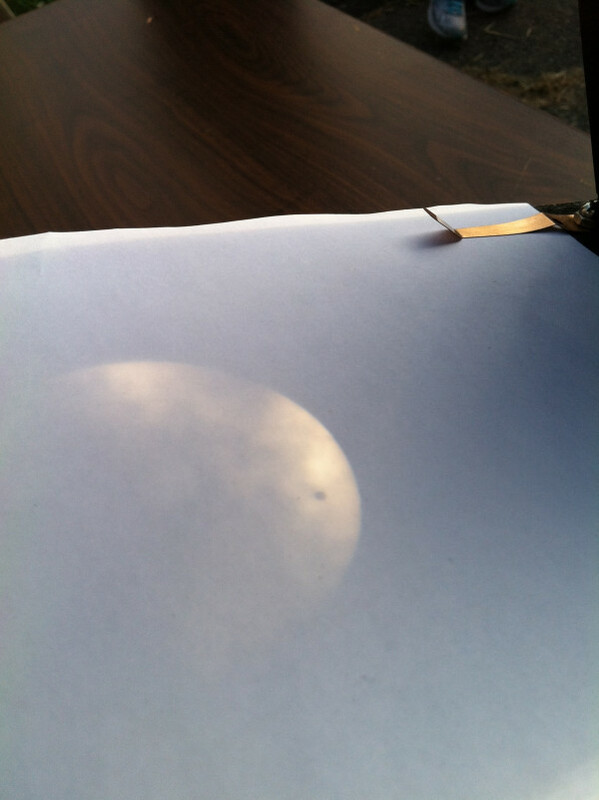 You can see the effect when looking at the Sun shown below during the transit of Venus. Transit of Venus – Image credit- Wikipedia – http://en.wikipedia.org/wiki/File:2012_Transit_of_Venus_from_SF.jpg – You can see the limb darkening is quite apparent. The edges of the sun are darker than the center. You can see the transits are more U-shaped like we see in the Planet Hunters interface. Now the plot is very zoomed in, it shows 3x the star’s radius on either side, but if you zoomed in on Planet Hunters this is what you’ll see for a spotted transit if the planet is very large and the transit depth is pretty large compared to the measurement noise of Kepler. Another factor to account for is the impact parameter. You can think of the planet’s transit across the star in the x- direction and think of the impact parameter as the y project coordinate of the transit. In essence you can think of as the impact parameter (b) as how close in the y direction is planet to the center of the star’s disk. You can see for the highest impact parameter (where the planet is crossing very close to the edge of the star) the transit looks pretty V-shaped like an eclipsing binary eclipse when we account for limb darkening. This is why if you see a V-shaped transit we typically think it’s most likely not a planet transit because the vast majority of times the planet transits will be U-shaped with a flatish bottom. You also see the depths on the bottom change slightly. This is because they are not all crossing the very center of the star which is the brightest point anymore. One other factor that will effect the shape will be the duration of the transit which depends on the orbital period of the planet and the eccentricity of the orbit, but for all of these plots I’m plotting in the X-axis in terms of the size of the star. It’s been an exciting week for exoplanets with the discovery of PH1 and the discovery of an Earth-mass planet around the closest star to Earth (Alpa Centauri B). 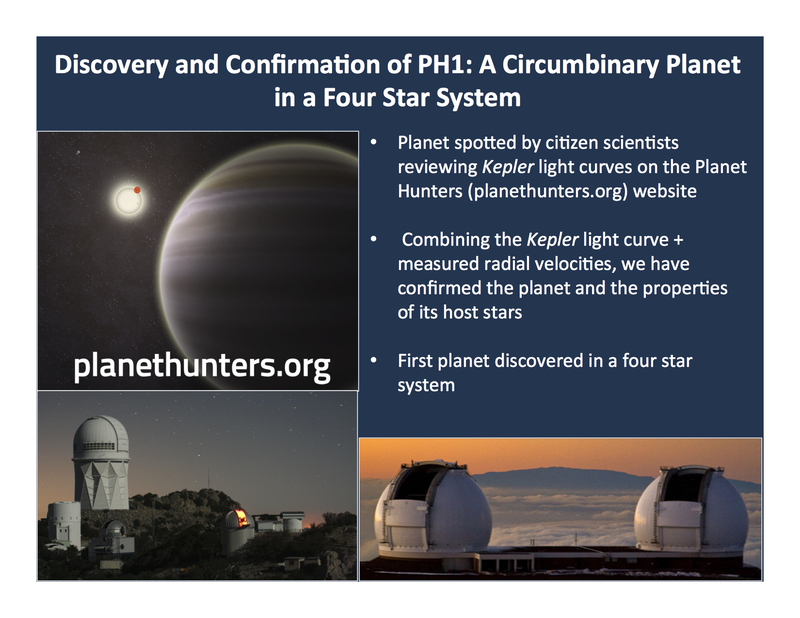 In the coming days and weeks, you’ll hear more about the specifics of how we came out confirming and validating the discovery of PH1 and solidifying that it was a planet orbiting the two central stars in a four star system, but I wanted to give a brief summary of the data and results. This effort has taken months and months from obtaining the telescope observations, to modeling the light curves, combining Kepler data with radial velocity observations, and applying stellar evolution models. Robert Gagliano and Kian Jek get enormous credit for the discovery and starting this process off and recognizing and spotting the planet transits. Many collaborators have worked hard to confirm PH1 and study its properties, especially: Jerry Orosz, Josh Carter, Willie Torres, and Debra Fischer who have put tremendous effort (particularly in the past few weeks) to get us from so we found some transits to bona fide planet. 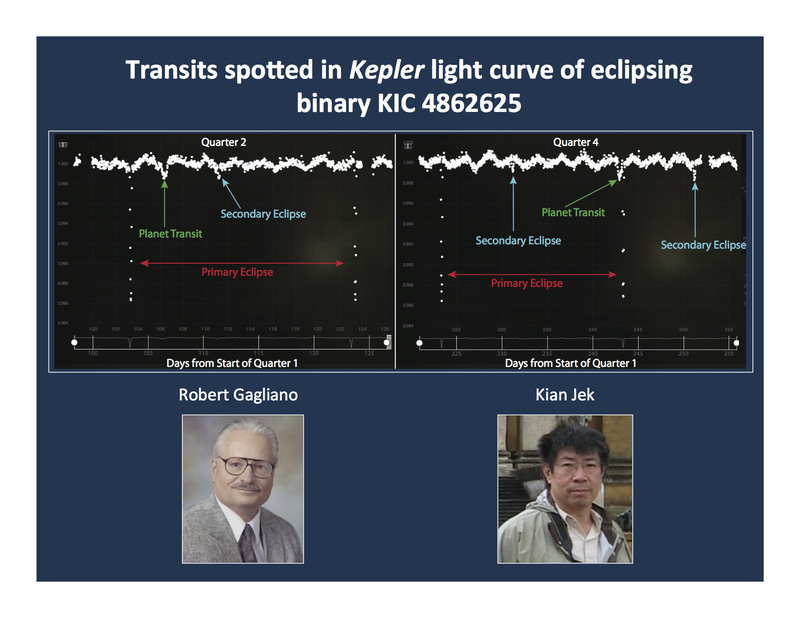 Robert and Kian identified three transits in the light curve of an eclipsing binary . In the binary, there are two stars, one larger and hotter and one smaller and cooler. When the smaller cooler star crosses the face of the larger hotter star, you get some of the larger star’s blocked out and we call that a primary eclipse. When the smaller cooler star crosses behind the larger hotter star, we get a secondary eclipse where the light from the smaller cooler star is blocked out. So we see this big dip+ small dip pattern. 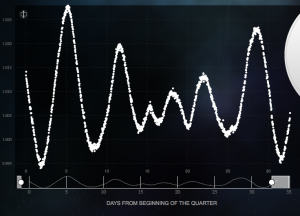 Robert and Kian noticed three transits separated by ~137 days in Quarters 1-5 data superimposed on the light curve indicating a third small body in the system, and notified the science team of a possible circumbinary planet. There’s a small chance that we’re seeing a false positive, where on the sky our Kepler eclipsing binary is aligned with a faint background eclipsing binary giving rise to the transit-like signal. If the transiting body is truly orbiting both stars, we have a way of checking. A body in a circumbinary orbit (orbiting around both stars in a stellar binary), is orbiting a moving target, so the positions and velocities of the two stars are different each transit. So this means that at each transit, there are slightly different gravitational tugs on the planet causing the timing and the duration of the transit to change. 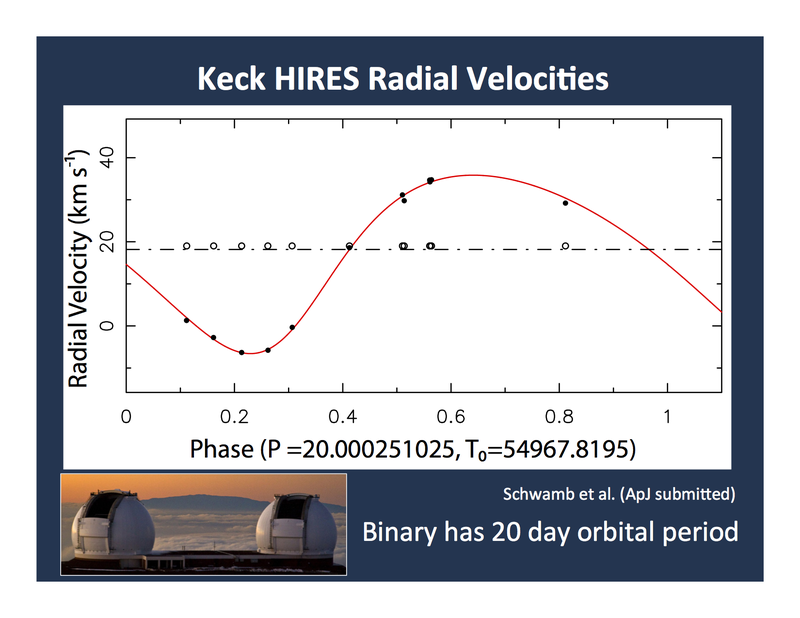 We see these changes and this gives us high confidence the planet is really orbiting the Kepler eclipsing binary and not some background source. If you look below at the 7 planet transits across the larger bigger star in the binary, you can convince yourself that the widths of the transits are changing. So bingo, planet! We got radial velocity observations from the Keck telescopes on Mauna Kea. 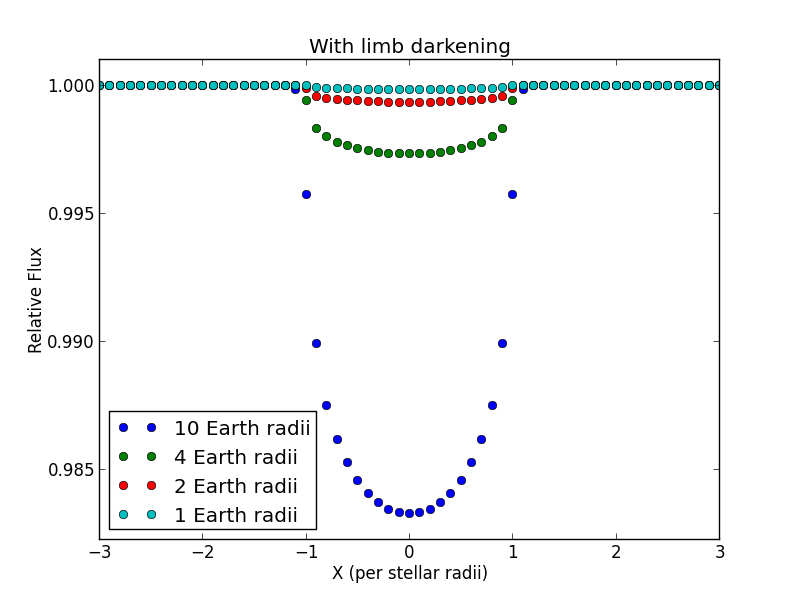 The radial velocity observations measure the wobble of the larger star in the binary that the planet orbits. With the precision of the observations and time duration we have on the observations, we cannot measure the wobble caused by the gravitational pull of the planet. What we are measuring is the wobble due to the gravitational tug of the smaller star as it orbits the larger star in the binary. To our surprise we found two velocity contributions in the radial velocity observations. One is from the larger star in the eclipsing binary (solid points) with the model fit for the velocity observations shown in red. The 2nd component is stationary over the roughly 5 months we were taking radial velocity observations. This 2nd component is coming from a source that is providing some light in the spectra slit we place across the Kepler target when observing on Keck. It has the same value as the average or systemic velocity of the binary. So if you take the average value of the black points that’s the velocity of the eclipsing binary (and planet host stars) moving towards or away form us. This second component has the same velocity and random field stars have velocities in the galaxy ranging from ~20-60 km/s so to have a source that has to be very close to the eclipsing binary on the sky that we see it in the Keck observations and have the same average velocity as the eclipsing binary tells us that this source is bound to the eclipsing binary. We used adaptive optics observations from the Keck II telescope to zoom in and look around our eclipsing binary for other stars that would be contamination the Kepler photometric aperture. We also used deep optical imaging to look for slightly further contamination stars as Bill Keel described in his blog post. As Bill discussed in his post, if there are stars providing extra light to the aperture that is summed up to make the Kepler light curve, it will give us the wrong planet radius. This is because the extra light will decrease the observed transit dips causing us to underestimate the size of the planet. We go these adaptive optics observations while we getting the radial velocity observations. 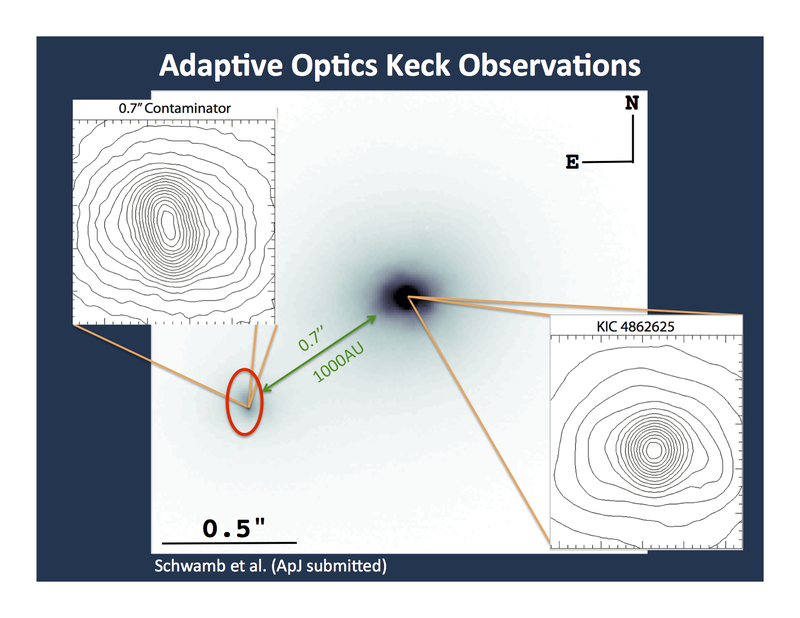 In the adaptive optics observations there is a source 0.7” away (or about 1000 AU) from the eclipsing binary, and we knew about its existence when we were analyzing the Keck radial velocity observations. There is was the ah-ha moment, where we went oh, this source in the adaptive optics observations must be that second velocity source we see in the radial velocity observations, that we think is gravitationally bound to the eclipsing binary orbiting well outside the planet’s orbit. To our surprise the adaptive optics observations revealed that this source is elongated in one direction (which you can see in the slide below). What we think this means is that we’re just barely resolving the source as a visual binary (2 stars!). So that we have a pair of stars, getting 2 for the price of 1 – (getting us to four stars in the system!) orbiting the eclipsing binary. Our best guess from the Keck observations is that the 2 stars in the distant binary are separated by no more than 40-50 AU. Combining all of these observations, we went after obtaining the properties of the planet and the stars in the PH1 system. Here below are the properties that come out of the combined photometric-dynamical model that uses the radial velocity observations and Kepler light curve for both PH1 and the stars,. The age we estimate for the entire system from spectral modeling. We estimate the mass of the planet by the fact that it not massive enough to pull on its parents stars sufficiently for us to see slight changes in the timings of when the stars eclipse each other (so when the smaller cooler star crosses the face of the larger hotter star and when the smaller cooler star crosses behind the larger hotter star). We confirmed with modeling the eclipsing binary properties with just the Kepler light curve, and we’re confident in our estimation for the planet and host star properties. The planet is a gas giant, a bit bigger than Neptune and slightly smaller than Saturn. PH1 orbits its parent stars at a distance between Mercury and Venus in our own Solar System. The planetary system is stable. The planet happily orbits the eclipsing binary every ~138 days not really noticing there’s a second pair of stars out at 1000 AU . PH1 is the 7th circumbinary planet, and the 6th circumbinary system. Below are the orbits of all the circumbianry Kepler planets and PH1 (not depicting the second distant pair of stars).So why do we care? Well, circumbinary planets are the extremes of planet formation, and we need to understand how they form if we are really understand how we form planets in our own solar system. Planet formation models need to be able to explain both environments, and each of the systems detected gives us another puzzle piece to this picture. Today we have a guest post by Tom Barclay, Tom is a member of the Kepler team and also a collaborator and co-author on our second Planet Hunters paper. Tom is a research scientist supporting the work of the Kepler mission. He got his Ph.D from University College London in the UK before moving to NASA Ames Research Center in California where he spends time improving the quality of the Kepler data products, finding new planet candidates and supporting the wider astrophysics community. 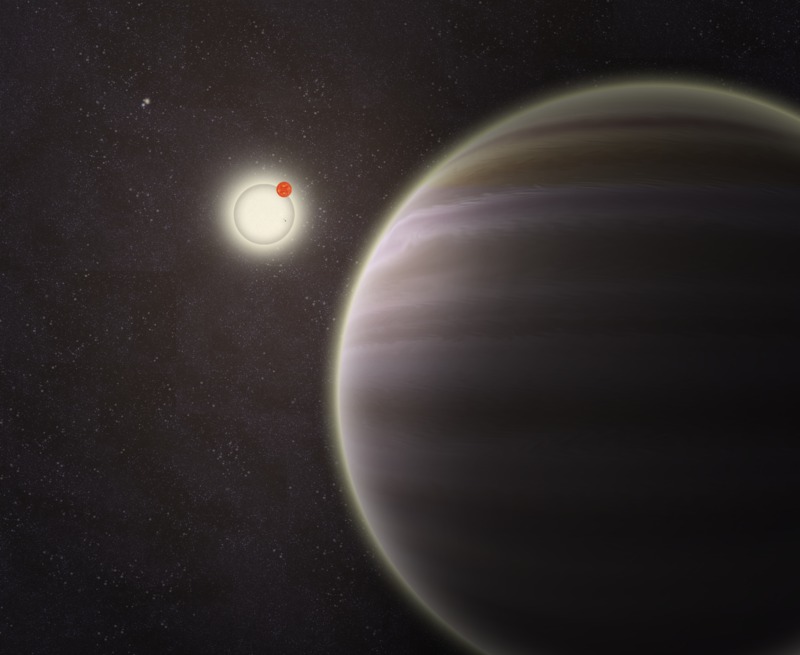 The Kepler team have found several thousand exoplanet candidates. The number of targets showing transit-like signals is increasing on a nearly daily basis as we search through light curves. However, these candidates are just that, candidates. Even though the planet candidates list is thought to have a high degree of fidelity, meaning that the vast majority of candidates are indeed real planets (somewhere in the region of 90%), it requires significant amounts of time and resources to turn a planet candidate into a planet. I’ll start by being careful with my terminology. The Kepler team use two terms when deciding a candidate is a planet. Confirmation and validation. The former generally only used when we have spectroscopic radial velocity follow-up observations. These are measurements of the wobble induced on the star by the mass of the planet. The planet and star orbit a common point in space. When the planet is moving towards us the star moves away, and vice versa. When the star moves away it gets a little redder and when it moves towards us it get a little bluer. We measure these shifts and it tells us how fast the star is moving in along out line of sight. Radial velocity measurements in combination with a transit give the planet’s mass and radius. A radial velocity detection of a planetary mass object (normally taken to be less than 13 Jupiter masses) is very unlikely to be erroneous and we are therefore happy to confirm the existence of a planet. In order to measure a radial velocity a planet must be close enough and massive enough to have a measurable effect on the star. The best instruments currently available are sensitive to a periodic change in radial velocity of around 1 m/s and even getting this precision requires a bright star. The Earth causes a radial velocity pull on the Sun of around 10 cm/s, measuring with this precision is out of the question with currently available instruments. We therefore require another method to use another method if we want to turn small planet candidates into planet. 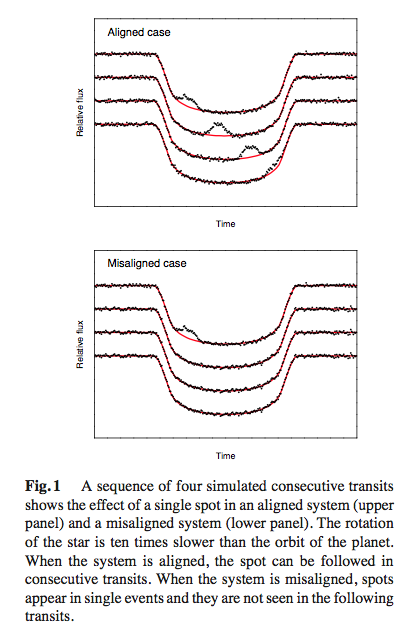 Validation of a planet applies when we use a statistical argument to say that it is much more likely that the transit signal is caused by a planet passing in front of the the target star (I’ll call it star A) that it is to be caused by something else. There are 4 main ‘something else’, or false positive, scenarios we consider. A background eclipsing binary is a system of two stars that are appear fainter than star A, usually because they are far away (although they could be intrinsically faint stars which are, counter-intuitively, in the foreground between us and star A). The two fainter stars pass in front of one another much like a transiting planet does and cause a periodic dip in brightness. Because star A is much brighter than the eclipsing system, the eclipse depth appears to be much shallower than it really is and hence the eclipse looks similar to planet transiting star A. A background planetary system is much the same as scenario (1) but the fainter system contains a star and a planet instead of two stars. If we think the transit is of a planet around the larger star A, we get the planet radius wrong. If we are not careful this scenario could cause us to claim a Jupiter-sized planet is Earth-sized. Scenario (3) is what is known as a hierarchical triple. There are three stars in the system, star A and two lower mass stars which eclipse each other and orbit around the same center of mass as star A. This is more common than one would initially think guess. Around half of all stars are members of binary systems and in the region of 10% of these are triple or multiple star systems. The light from star A washes out the eclipse of the smaller stars and the eclipse looks much more shallow than it intrinsically is. Finally, there is the case where a star-planet system orbits star A. The depth of the transit is decreased by the presence of extra light from star A and we get the planet radius wrong. We try to obtain high resolution images using fancy techniques like adaptive optics imaging which changes the shape of one of the telescope’s mirrors to correct for the movement of the air in the atmosphere. These images allow us to see very close to the star and therefore look for other stars nearby in the image that could cause the transit-like signal. Typically if we don’t see star nearby star A we are able to say there are no stars further than 0.1 arcseconds away (0.00003 degrees) which could cause the transit-like signal. We are then able to make use of models of our Galaxy to predict the probability that there is a star in the right brightness range and within the allowed separation from star A that could mimic the transit signal. It is common for us to be able to say there is less than one in a million chance of a there being an allowed background star. When we take into account the probability that a background star is an eclipsing binary or hosts a planet the result is usually that it is very unlikely that there is a background eclipsing binary or star-planet system. Ruling out a physically associated star-planet or eclipsing binary system can be much more challenging. We can again use the high resolution imaging but it is much more likely that a companion star is very close to star A than is the case for a background star. One thing on our side is that the shape of the transit can be used to rule out a stellar eclipse: eclipses are usually much more ‘V-shaped’ than the typically ‘U-shaped’ planet transit. We can often say that we cannot fit the shape we observe with a stellar binary. It is also possible to rule out planet transits around a smaller star because the timescale of the ingress and egress (the part of a transit where the planet is moving into and out of transit) does not agree with the transit depth as both these piece of information yield the planet radius. 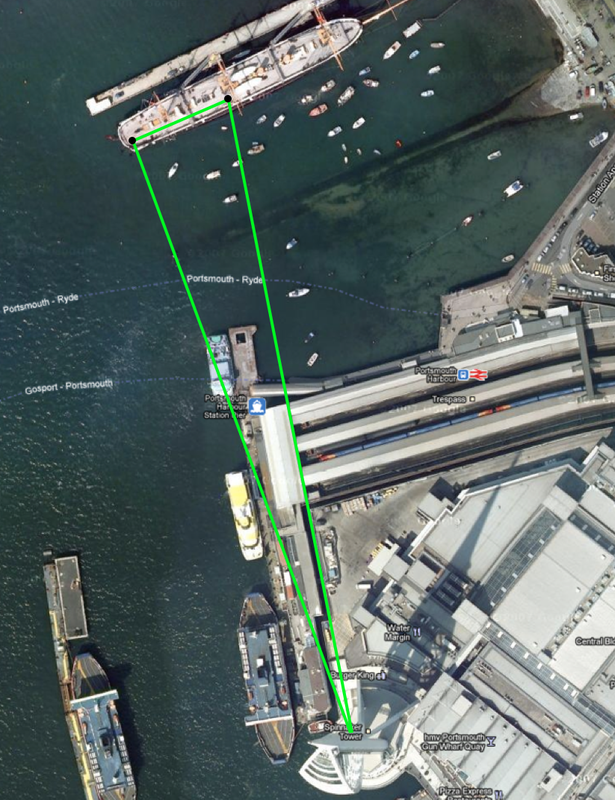 However, we really need good signal-to-noise in order to place firm constraints on the ingress and egress durations. Even so, it always gives us some information even if it is not particularly constraining and this can be used to calculate a false positive probability. The final step is to sum up the combined false positive probabilities from the different scenarios and compare that to the probability that the transit signal is due to a planet transit around star A. If the transit scenario is much more likely (say 1000 times more likely) than a false positive we claim the planet is validated. On other occasions we have to hold our hands up and say we can’t rule out the false positive scenario with a high enough degree of confidence and the source of the signal remains a planet candidate. 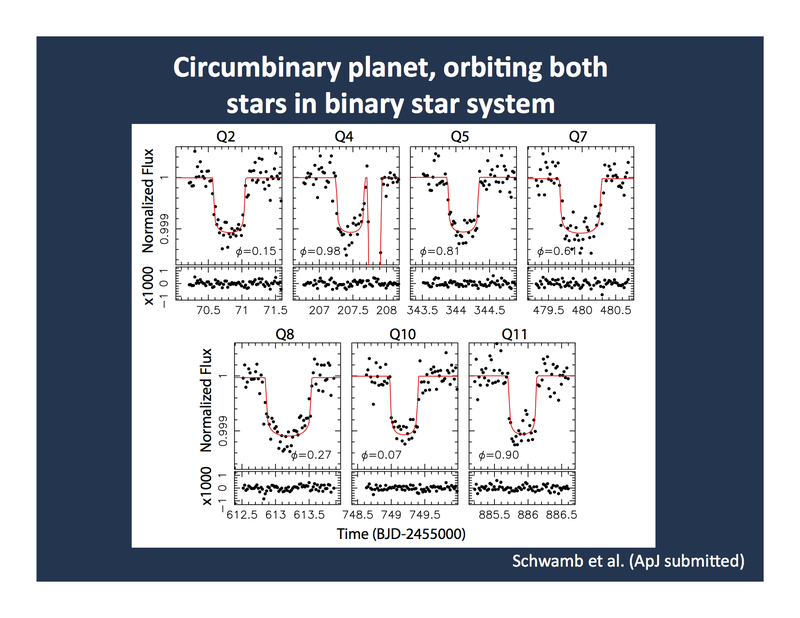 The case where stars host multiple planet candidates, such as that found by the Planet Hunter in the paper by Chris Lintott, is a particularly interesting one. This is because the probability that the a multi-planet candidate system contains a false positive is much lower than for single planet candidates system, somewhere in the region of 50 times less likely. This makes validation much easier. 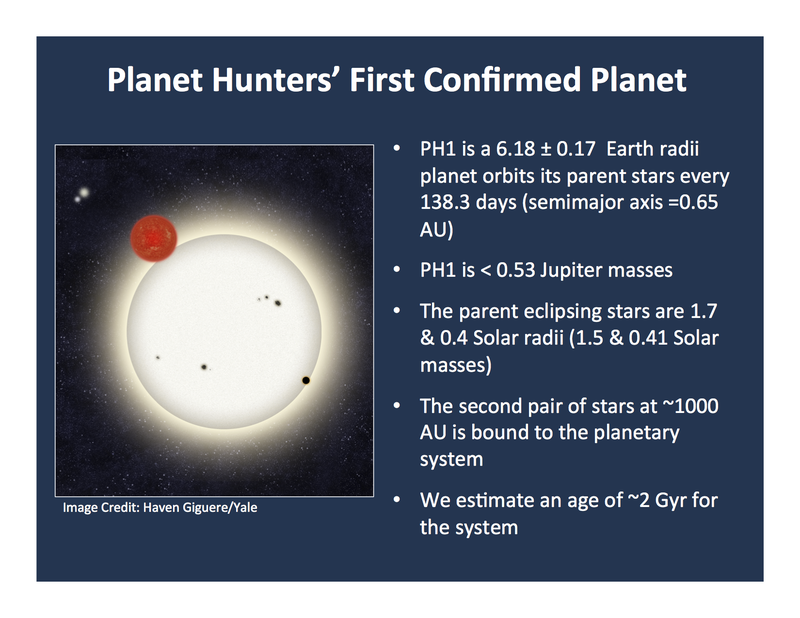 Planet Hunters have already shown they can find these multi-planet system. Keep searching a more will appear, especially long period ones. There is a good chance that there is an Earth-like planet hiding somewhere in the data currently available. 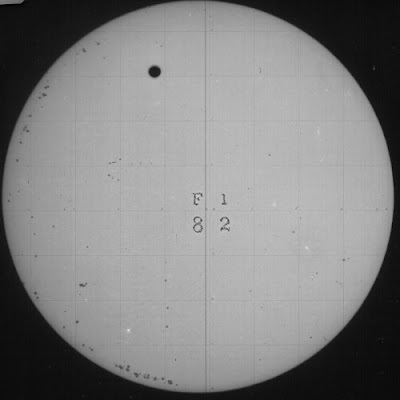 As I write this blog post, the transit of Venus is ongoing, with Venus finishing its slow march across the face of the Sun in less than an hour. The next time this will event will come around will be well after out life times in December 2117. The internet has been abuzz with these breathtaking images of the transit from all over the world from space telescopes,ground-based telescopes, even iphones strapped to solar eclipse glasses(!). I wanted to share my impressions of the event and how that ties into what we do at Planet Hunters . 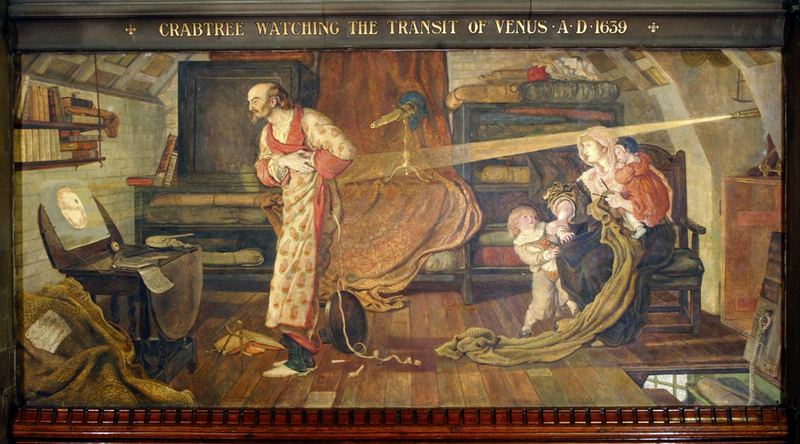 For me personally, I wasn’t expecting to see the transit of Venus from New Haven. Yale’s Leitner Family Observatory was planning events, but it was cloudy starting in the morning, and it was predicted to be that way all day. I still packed the eclipse glasses, that I had gotten from the conference in Japan that I was at a few weeks back (the conference ended the day before the annular solar eclipse), in my bag before heading out this morning. I was hoping but not holding my breath for there to be a clearing of the clouds later in the afternoon, but it had rained midday. The clouds were thinning a bit in the afternoon, teasing with some small glimpses of the Sun or a brief moment where the sunlight could be seen trying to peak through. I remember on one of my first observing runs, when the weather was bad talking to the lead observer, the older graduate student in my research group. I remember her telling me about sucker holes in clouds, holes in the otherwise thick cloud cover. They happen, but not go to chasing them with your telescope because the can close and move just as fast as they appeared. I was hoping maybe we’d get a clearing in the clouds but it didn’t look like it was going to. I was already resided to the fact I was going to be watching online on the live streams. I had even lamented to Chris who’s in Norway, in the land of the midnight Sun, for the transit who also had clouds from horizon to horizon for the start of the event. I got on the bus to go home, and noticed what I thought was sunlight on the buildings. I got off a few stops later so I could walk the rest of the way home (or to the observatory just in case), and low and behold – a sucker hole had opened and there was the Sun struggling but nearly all the way out of the clouds staring back at me right above the astronomy building. I pulled out those eclipse glasses and my own eye glasses (that I rarely wear) and there it was. A bit of cloud still coming over in waves across the Sun’s disk, but there was a black spec on the top right. That was Venus! I made it to the Leitner Observatory where the other postdocs and grad students were, sharing our eclipse glasses to the members of the public who had come to the event and were in line to see through the solar telescopes. We also also got a chance to see the transit through solar telescopes. I captured a neat image from a solar spotter that an amateur astronomer (and also a fellow Planet Hunter) had kindly brought along. As the sun set, the clouds came back as quickly as they had parted and the sky was covered and grey again. I have to say it was truly breathtaking and I hope you got to see it yourself and if you didn’t see it outside that you were able to view the transit online. It is amazing to think that that small dark sphere is really a planet moving in front of our Sun. One of things for me that is so fascinating is how our view of exoplanets has changed since the last transit of Venus, which occurred in 2004. Kepler hadn’t launched, we didn’t have over 2000 transiting planet candidates (or Planet Hunters 🙂 ) Kepler really has changed how we view the universe around us, with extreme worlds orbiting two stars as well as the first detection of Earth-sized planets, and the first set of planets orbiting in the habitable zone of their stars (meaning if they were rocky or had rocky moons they might be able to have liquid water pool on their surfaces). The same way that Venus is blocking out part of the Sun’s light (about 0.1%), is the way we identify planets in the Kepler light curves with Planet Hunters. If aliens in another solar system could watch the Sun today/yesterday, they would see a drop in light of about 0.01% for nearly 7 hours indicating Venus’s presence. 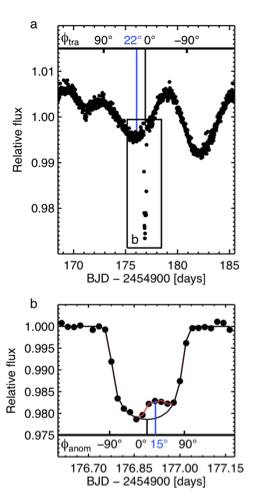 We see the drops in the light curves indicative of a planet orbiting their parent stars in the Kepler field. We’ve already found four new planet candidates that weren’t previously identified by the Kepler team but there’s something different in seeing the light curve compared to seeing the Venus transit live. I’ve always known these planet candidates we’re finding are marching across the disks of their parent stars, but seeing the transit of Venus it felt real. 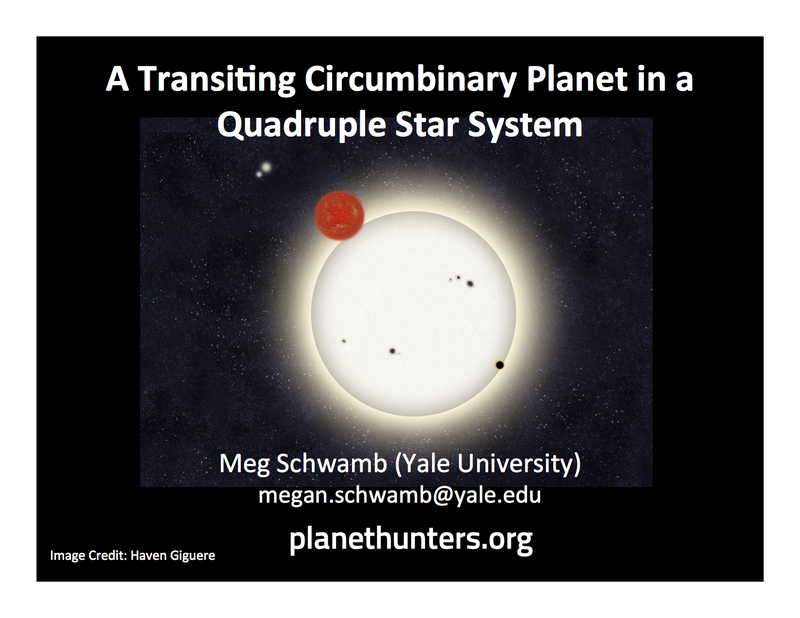 I’m heading back to spend the rest of the night working on my next Planet Hunters paper, thinking about the transits and planetary systems we’re finding and it feels just a bit more familiar…..a little bit closer to home…. PS. Fancy looking for some more transiting planets, come to the Planet Hunters website and give it a try.